Register for the PoHo Hot Cocoa today! Join us for the 8th Annual PoHo Hot Cocoa Event! The race course winds through historic downtown Port Huron and along the St. Clair River with a beautiful view of the Blue Water Bridge. Proceeds from the event will go to several local cross country and programs. This year we are offering 4 courses with a 10 Mile, 10k, 5k and Kids 1 Mile. Races start of January 26th with the the Kids 1 Mile at 9AM and the 10 Mile, 10k and 5k at 9:30AM. Registrants for the 10 Mile, 10k and 5k will receive a full-zip jacket. Images can be found on our event Facebook page. Youth runners will receive a long sleeve t-shirt with registration. Packet pickup on January 25th will be 10AM-6PM at Elite Feet (327 Huron Ave., Port Huron, MI). 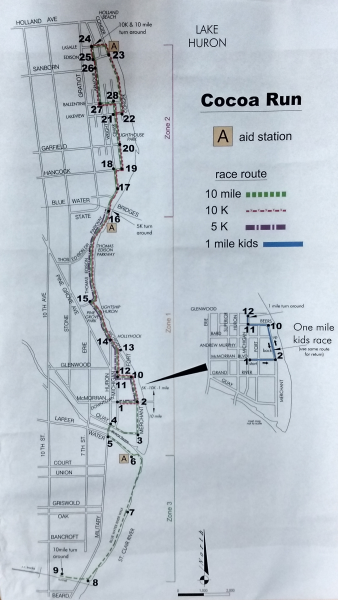 Packet pickup on January 26th (race day!) will be 6AM-8:45AM at the SC4 Fieldhouse (400 Erie St., Port Huron, MI). If you plan to pick up your packets on race day please arrive at least an hour before the start of your event. The post race chocolate party will be at the SC4 Fieldhouse (400 Erie St. Port Huron, MI) immediately after the race. Runners will be provided with hot cocoa catered chocolate fondue with fruit, graham crackers, marshmallows and other goodies. There will also be bounce houses, multiple running brands with demo shoes and local businesses present at the post race party. Join us for the Chilly Fest immediately after the race! Port Huron Chilly Fest is an annual winter event with beautiful ice sculptures, live music, bed races in the street, a chili cook-off competition and more! Any race changes or participant switches need to be submitted by January 21st. Anything after incurs a $10 fee. There will be no refunds after January 21st.